My mother gave me this gorgeous suede shirt/jacket. She told me it was washable suede. How does one know when suede is washable and when it is not? Sorry, I can’t help with that. She had washed it successfully before. I do know that I positively hate dry cleaning my clothes. I can’t bear the smell of the chemicals they use and I am sure they can’t be good for you. As for what the solvent they use – perc – does to the planet, I shudder just thinking of it. I hand wash as much as I can. And you know what? My clothes come out cleaner than they do from a professional cleaner. The trick is to dry the clothes flat so they don’t pull out of shape. Use a pure detergent and don’t wring them out. If you have to iron, use a cool iron. Back to my suede jacket. I washed it in the machine on a woolen wash and it came out perfect. I looked up on the Internet how to iron it. Between two cloths with a cool iron and it must not come in direct contact with the iron. I am pleased to say the jacket looks as good as new. I also needed to make the sleeves a bit shorter. There was no way that suede would go through my sewing machine. I used strong glue and pegs to hold the hem in place until the hem had dried. Since my model is posing today, I am sharing the details of her outfit. She is carrying the easy tote bag I made a while back. The link for that project is here – how to make a tote bag. The harem pants were made from gym pants. 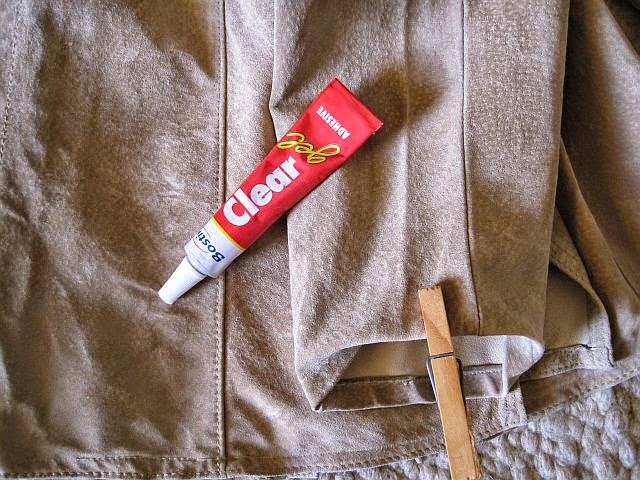 Visit this post for the instructions – how to make harem pants. And the scarf is one of the pieces I picked up on my round trip of Southern Africa. Ethnic touches are so hot right now and a scarf is the easiest way to bring in a bit of colour. 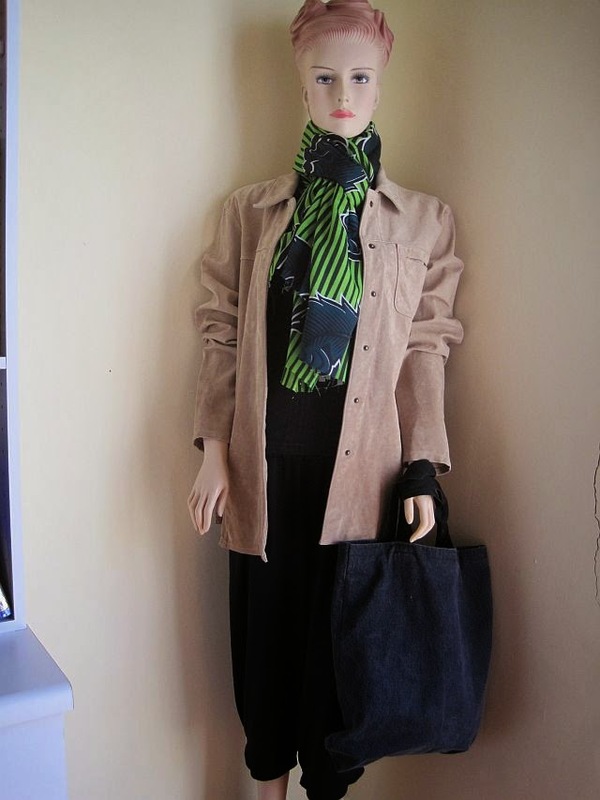 I have shown how to make a no-sew scarf in an older post – how to make a scarf. The tank top was bought new a long time ago. Four out of 5 items are home-made or vintage. My model gets a 80% eco rating. Check out the Greenie Galleries at the top of this page. They are archives incorporating older and newer projects with pics and links to that particular post. Think curtains to caftans, beads to rings and FREE sewing patterns. Thanks for sharing this with us. Lot of us are really confused sometimes as to how to wash suede clothing. I am glad to come by here and get all this information.